These 7 inch long sticks are sweet and rich with a mild Juniper aroma. Made from various aromatic herbs found in the high altitude region of Tibet and the plains of Nepal, this herbal medicated incense is made under the strict control of Traditional Tibetan handmade incense following the key instructions of renowned herb masters. This bamboo tube covered in handmade paper contains a small wooden burner, a string-tyed bundle of approx. 30 tibetan incense sticks with a 45 minute burn time. These 7 inch long sticks are sweet and rich with a mild Juniper aroma. Made from various aromatic herbs found in the high altitude region of Tibet and the plains of Nepal, this herbal medicated incense is made under the strict control of Traditional Tibetan handmade incense following the key instructions of renowned herb masters. 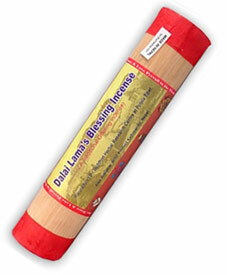 It is widely used by Buddhists and by others for the purpose of meditation, purifying, and offerings. This bamboo tube covered in handmade paper contains a small wooden burner, a string-tyed bundle of approx. 30 tibetan incense sticks with a 45 minute burn time.